Large green expanses, lush and dewy, surrounded by the large, dominating architecture of the colleges that surround it: welcome to The Backs! The large patch of green is the land that lies behind the colleges of Cambridge University. With humble beginnings, this area has turned into one of the best spots in the city to grab some fresh air and take in all the details of the picturesque surroundings. The Backs was once filled with pastures, gardens and orchards that were separately owned by the colleges, but over time, it was transformed into the Grade I Historic Park that stands today. Avenues of trees, sturdy bridges and the best possible view of the King’s College chapel are just a few of the lovely treats that make this stretch of land so special. Covered by the Magdalene College, St. John’s, Trinity, Clare, King’s and Queen’s, you’ll be treated to quite a spectacular sight of medieval construction, nestled between the River Cam and the orange sun. There are a decent amount things you could do if you can resist the urge to lounge about and dip your toes in the river. There’s the romantic covered bridge, the ‘Bridge of Sighs’. It closely resembles its Venetian counterpart and is just as gorgeous. It would be the perfect place to take someone special. The Mathematical Bridge is the name given to a wooden footbridge which connects both sides of Queen’s college together. Its name comes from its construction: though the bridge appears curved, it was created solely out of straight sticks and twigs. You can carry a light snack and a bottle of something sweet and watch the punters do their business on the river. Though entry is restricted, if you take up a guided tour or pay the entrance fees to the colleges, you should have no problem exploring these beautiful gardens. 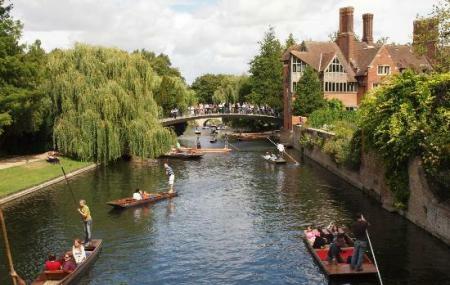 Also, visit the popular attractions in the city by following Cambridge itinerary 1 day. The best time to go to The Backs are in the evenings during Autumn or Winter or as early in the morning as possible as you will have more time to take in the sites around you. Then your punt guide can carefully talk you through the historical buildings and characters. You can venture out during the evening as well. How popular is The Backs? People normally club together The Fitzwilliam Museum and Market Square while planning their visit to The Backs. A great walk around Cambridge with the colleges and river next to us. Punting trips are available but probably expensive (didn't look at price). All I can say is that it was very commercialised. Visitors are allowed in yo some of the colleges but entry fees are high. One of the more beautiful parts of Cambridge the backs and the river are even more stunning in the summer. There are regular guided boat trips but if this doesn't sound appealing you can hire a boat and go punting yourself. Be warned it is more difficult than it appears. If this sounds entirely like too much effort sprawling out on the riverbank is also an option. A visit to the wren library is a plesant diversion where you can see the original manuscript of Winnie the pooh or Isaac Newton's cane. Lovely place to visit on a nice day.